Jugged hare is described in the influential 18th-century cookbook, The Art of Cookery by Hannah Glasse, with a recipe titled, "A Jugged Hare", that begins, "Cut it into little pieces, lard them here and there ..." The recipe goes on to describe cooking the pieces of hare in water in a jug set within a bath of boiling water to cook for three hours. 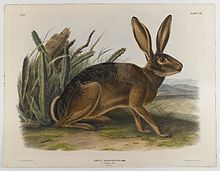 Beginning in the 19th century, Glasse has been widely credited with having started the recipe with the words "First, catch your hare," as in this citation. This attribution is apocryphal. In European tradition, the hare symbolises the two qualities of swiftness  and timidity. 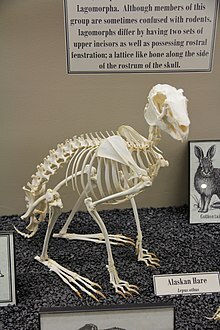 The latter once gave the European hare the Linnaean name Lepus timidus  that is now limited to the Mountain hare. 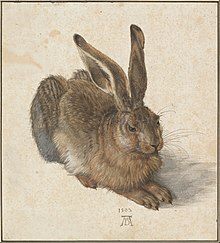 Several ancient fables depict the Hare in flight; in one concerning The Hares and the Frogs they even decide to commit mass suicide until they come across a creature so timid that it is even frightened of them. Conversely, in The Tortoise and the Hare, the best-known among Aesop's Fables, the hare loses a race through being too confident in its swiftness. In Irish folklore, the hare is often associated with Sidh (Fairy) or other pagan elements. In these stories, characters who harm hares often suffer dreadful consequences. In June 2014, the Pushkin House (the Institute of Russian Literature of the Russian Academy of Sciences) hosted the international conference, "The Philosophy of the Hare: Unexpected perspectives in the research in the humanities". The conference organizers came up with the idea as a retort to an earlier claim by Russia's Minister of Culture Vladimir Medinsky that humanities scholars were wasting government money conducting research on incomprehensible topics with names such as the one they chose. ^ Holly, A.J.F. & Greenwood, P.J. (1984). "The myth of the mad March hare". Nature. 309 (5968): 549–550. doi: 10.1038/309549a0. ^ Flux, J.E.C. (1987). "Myths and mad March hares". Nature. 325 (6106): 737. doi: 10.1038/325737a0. ^ Hoffman, R.S. ; Smith, A.T. (2005). "Order Lagomorpha". In Wilson, D.E. ; Reeder, D.M. Mammal Species of the World: A Taxonomic and Geographic Reference (3rd ed.). Johns Hopkins University Press. pp. 195–205. ISBN 978-0-8018-8221-0. OCLC 62265494. William George Black, F.S.A.Scot. " The Hare in Folk-lore" The Folk-Lore Journal. Volume 1, 1883.